We are happy to welcome you on Bali, the most beautiful “Island of Gods”. This Indonesian Island is perfect for holiday all year round. 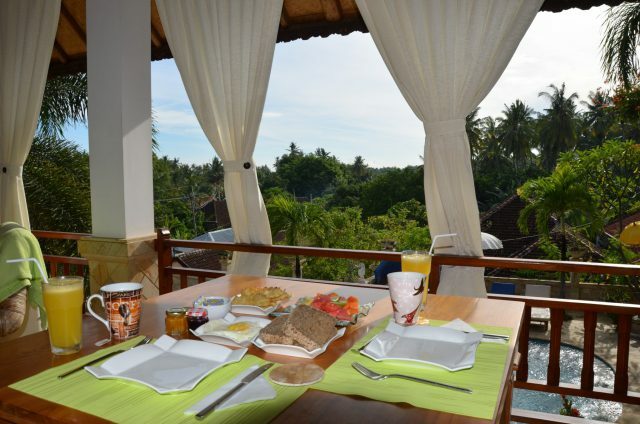 Our holiday villas are located up north, where you find a green environment near the coast of Lovina. We are renting out rooms the hole year in our double-storey buildings called Jakaranda and Marakuya. All rooms are equipped with double beds and open bathrooms. The Villa Marakuya (350 sqm) contains four double bedrooms which are spread over two floors. Each guest room is 25 sqm with an additional open bathroom of 10 sqm. The bathrooms are featured with a double-sink and a walk-in shower. Every bedroom has AC, ventilator, minibar, safe and a 25 sqm veranda. A large swimming pool (16m long) with a waterfall invites to swim and splash. We also have a round jacuzzi which is perfect to linger and relax. Beside free wi-fi we have many additional useful services. As for example a wash- and ironing-service or the opportunity for a massage, whenever you feel like having one. If left-hand traffic is not for you naturally we offer you a driving service. “In the morning like an emperor, at noon like a king in the evening like a beggar.” We take the most important meal of the day – the breakfast – very seriously. Therefore, we love to spoil you every morning with a rich selection of components: fresh fruits, self-made jam and daily freshly baked bread and more. Of course you can tell us your individual wishes for your special breakfast. Wonderful beaches and beautiful vegetation, varied culture and culinary delights, many different activities – this and much more Bali has to offer. See for yourself and experience Bali’s beauty in our small paradise in Lovina. Check the availability easily right now and off you go to Bali! What our visitors tell about us. Wir durfen im März 2017 zwei Wochen in der Villa Jakaranda verbringen und können nur positives berichten. Die Villen und die Umgebung ist sehr schön und sauber. Das Personal war äusserst freundlich und hilfsbereit. Made und Jacqueline haben uns stets mit vielen Tipps (Ausflüge, Restaurants etc.) versorgt und uns tolle Ausflüge organisiert. Jeden Morgen wurde uns das umfangreiche Frühstück auf unserer Terrasse serviert. Und ab und zu wurden wir auf Kaffee und Kuchen eingeladen. Wir haben uns im Urlaub noch nie so gut erholt, wie in der Villa Jakaranda. Und wir empfehlen allen Reisenden, welche Bali besuchen, mindestens einige Tage im ruhigeren Norden in diesen Villen zu verbringen.